Summon: Look at the top two cards of your deck. Draw one, and discard the other. Indoril Mastermind is a rare Endurance creature card. It is part of the Houses of Morrowind expansion. 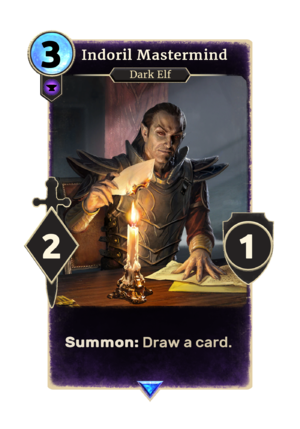 In addition to the card's availability in the Houses of Morrowind expansion, two copies are included in the Telvanni Ambition theme deck, and one copy in the Tribunal Glory theme deck. "They've no move we can't anticipate." This page was last modified on 2 March 2019, at 00:27.